Raw kefir is a fermented drink made from the milk of cows, goats or sheep. Raw kefir is not subjected to pasteurization or other filtration methods, so it contains more bacteria than milk that that has been pasteurized. While proponents of raw kefir and raw foods in general argue that these bacteria are safe, consult your doctor before drinking raw kefir, a protein-rich beverage. Raw kefir is moderately calorie-dense, as each 8 oz. serving provides 154 calories. That amount is just 4 g more than whole cow's milk provides and is 74 calories more than skim milk contains. One 8 oz. serving of raw kefir contains nearly 8 percent of the daily suggested intake of 2,000. Raw kefir is rich in fat, with 8 g in each 8 oz. serving. Of this fat, 2 g comes from saturated fat, which is 3 g less than the amount of saturated fat in whole cow's milk. Consuming too much saturated fat can be harmful, as it may increase cholesterol levels, which increases your risk of cardiovascular disease. The American Heart Association suggests limiting daily saturated fat intake to less than 16 g each day to limit your risk. Raw kefir is different from other types of milk in that it can be appropriate for low-carbohydrate diets. An 8 oz. serving of raw kefir contains just 4 g of carbohydrates, which is 9 g fewer than an 8 oz. cup of skim cow's milk contains. While high-carbohydrate diets don't promote fat gain, research published in the February 2006 edition of "Archives of Internal Medicine" indicates that low-carbohydrate diets can help you lose weight more quickly than higher carbohydrate diets. Raw kefir is a good source of protein, as each 8 oz. serving provides 9 g of protein. That amount is equal to the protein in 1.5 eggs. Protein promotes the construction and repair of your body's cells and tissues, so it's essential for proper health. The Institute of Medicine recommends consuming .8 g of protein for every kg of your body weight each day. 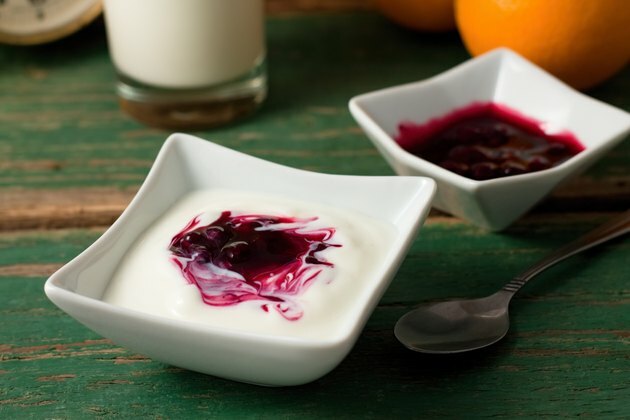 Can People on a Dairy-Free Diet Take Probiotics? What Are the Benefits of Kefir? What Raw Cheese Has Probiotics?